This is the first album in this "A To Z" series that I don't absolutely adore. However, don't let that detract you from listening, because it is still a good record. 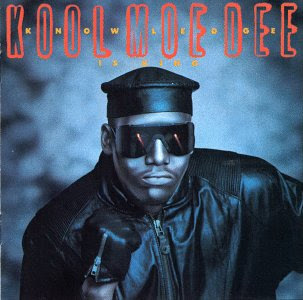 Kool Moe Dee is probably best known (unfortunately) for "Wild Wild West"...both his version and Will Smith's. Knowledge Is King is the follow up to the album with that track, released in '89 and follows closely the very things that make Moe Dee great and also why none of his albums are stone cold classics. The beats are never great, never. It is typical 80's fare, I suppose, but many of his songs seem to hit even softer than a lot of the other stuff in his genre, which does not work for his voice and flow. Which, if you have never heard Moe Dee rap, he definitely has one of the best flows in the history of hip hop, and is probably one of the best braggadocio rappers of his time, it's just a shame that his hard hitting rhyme style typically isn't matched by the production. If you like people like old LL Cool J or the bragging Big Daddy Kane tracks, then you should have no problem enjoying Kool Moe Dee, but if you are looking for something that is very substantial, like Public Enemy (who was releasing music at the same time, hard to believe), then this might not be your thing. Overall, it's a fun record, and worth a listen for all hip hop fans, but like all Kool Moe Dee records, a handful of improvements would make it a classic.